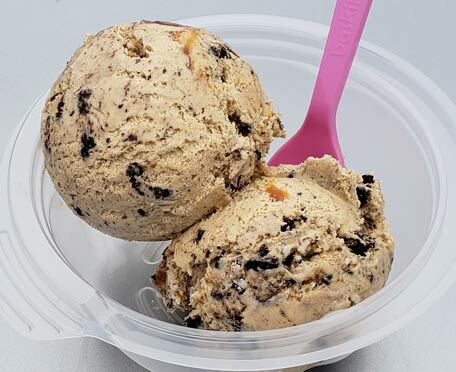 Everyone remembers I love cookies & cream ice cream right? Good, because I love this one too. It's really well balanced and I pretty much loved every bite (except the ones that were slightly freezerburned, those get a slight demerit from my taste buds). The nice thing is that while "sweet & salty" is in the description, it's neither too salty nor too sweet. It could have easily went overboard in any of several directions but it didn't. There's just a lot of great complimentary flavoring going on here. I'm always a little weary that their monthly flavor will be gimmicky (it's a thing, it happens), but this one works really well. So yeah, the combo works, nothing is out of control, and I could have easily shoved in four scoops instead of two (but then I would have just been full and uncomfortable for the rest of the afternoon). If you love C&C, give this a try, or if you want a caramel that's complimentary rather than the star player, give it a try as well. I was happy with my lunch, and hopefully you will be too. OSS BR is back. Yay! !